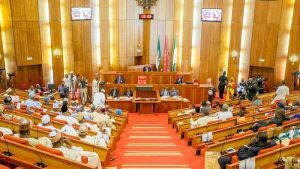 About six months after the presentation of the 2018 budget by President Muhammadu Buhari, Federal Lawmakers have passed the Appropriation bill. The two chambers of the National Assembly approved a budget of 9.1 Trillion Naira as against the 8.6 Trillion Naira presented by the president on November 7, 2017. In what appeared to be c the same month the 2017 budget was passed. The lawmakers said they approved the increase after consultations with the executive, where the oil benchmark price was increased from 45 to 51 dollars and that the additional 508 billion added to the budget was applied in critical sectors of the economy. A breakdown of the budget shows that of the 9.1 Trillion Naira total expenditure, recurrent expenditure is 3.5 Trillion Naira, capital expenditure is 2.87 Trillion Naira, the debt service is 2.2 Trillion Naira and statutory transfers of 530.4 Billion Naira. Although the 2018 budget has been passed one matter which will eventually have to be sorted out is the 496 million dollars for the purchase of the Tucano Aircraft, which the chairman, senate committee on appropriations said will have to come as a supplementary bill.